But marine ecosystems around the world are breaking down at alarming rates. Change comes quickly and protection often too late. Golfo Dulce is on the cusp of change. As the Osa region grows in popularity and population, competition for resources will undoubtedly intensify. The delicate gulf ecosystem will have to cope with escalating pressures from urbanization, commercial development, special interests, and tourism. 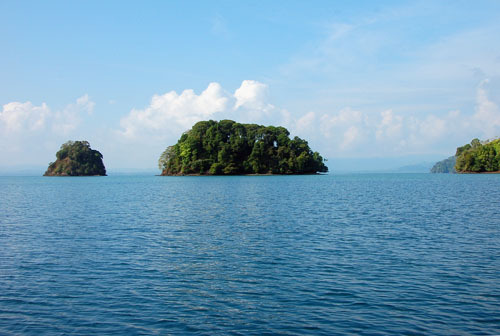 Incurred damage could prove irreversible, and since Golfo Dulce appears to play a considerable role in the reproduction of many species, the embayment’s welfare may even impact the ecology of the broader eastern Pacific. “Knowledge is power,” surmised Sir Francis Bacon. Scientists strive to uncover accurate details about the world. Those details, once shared, can help people make more informed decisions. With the help of many local community members, fishermen and guides, and the critical support of Osa Conservation and the Greg Gund Memorial Fund, our data may now serve to enlighten discussions about in situ conservation. Thank you for joining me for this blog series. I truly hope it enhanced your appreciation for Golfo Dulce and inspired you to support the mission of Osa Conservation, “to protect the Osa Peninsula’s globally significant biodiversity” and safeguard this rare tropical fiord. Brooke Bessesen conducted Marine research at the Osa in 2010 and 2011 as a recipient of the Greg Gund Memorial Fellowship. Check out her Golfo Dulce report on our website. Thank you very much, Brooke, for your insightful contributions to our blog! To learn more about marine conservation and current affairs on the Golfo Dulce, check out Andrea Johnson’s latest post about the proposed Crocodile Bay Marina project, and Ramy Zabarah’s recent post recounting a kayak tour through the gulf’s mangrove forest. This entry was posted in Marine Conservation, Science and Research and tagged bay, Bessesen, Brooke, Conclusion, Conservation, crocodile, Dulce, Golfo, marina, Marine, osa, Peninsula, research, Series. Bookmark the permalink.